New year, New you. Boost your detox. It’s that time of year again. After a month of over-indulging we’re all trying to live a little healthier; eating better, doing more exercise, drinking more water. After all, Summer bodies are made in Winter! While you’re making changes, why not add in body brushing to your daily routine. It’s quick and easy to do and has many benefits. Exfoliates. 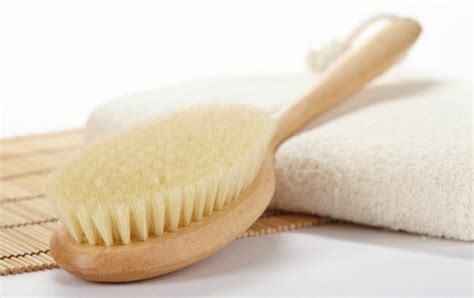 Body brushing lightly sweeps away any dead skin cells on the surface of the skin, leaving it feeling super smooth. Improves circulation. The tiny bristles stimulate blood circulation, helping to carrying important nutrients to the surface of the skin to improve its texture and appearance. Detoxifies. 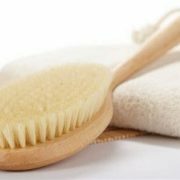 As well as blood circulation, body brushing also improves the lymphatic system, which helps carry waste out of the body. It helps break down fatty tissues in the body and helps drain toxic fluids towards the lymph nodes which helps to improve the appearance of cellulite. How to: On dry skin, sweep your body brush lightly over the skin in one direction, working towards the heart, following with the other hand to soothe. (So, on the legs working from ankle to knee, then knee to hip.) Repeat a few times. For best results, body brush every day. Take a few seconds first thing in the morning, before you shower, or before you go to bed. Make sure your drink plenty of water throughout the day to help replace water lost through the detox process. If you are unsure, see one of our therapists. Or, why not try our new LBT Detox treatment which includes body brushing, lymphatic drainage massage, wrap and scalp massage designed to wake up ‘lazy’ areas to reduce the appearance of cellulite and firm the skin.